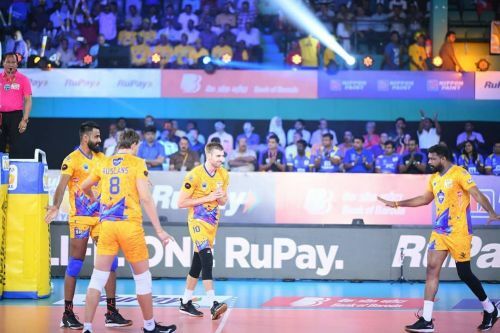 The second day of the Chennai leg of the RuPay Pro Volleyball League 2019 saw Chennai Spartans host Ahmedabad Defenders at the Jawaharlal Nehru Indoor Stadium in Tamil Nadu. The Spartans secured their passage into the semifinals with a dominant 4-1 win over the Defenders (15-6, 13-15, 15-13, 15-11, 15-12) in a strong all-round display. Chennai's Rudy Verhoeff was the top performer with 20 points and he was supported well by Naveen Raja Jacob and Ruslans Sorokins, each of whom scored 17 points. Dilip Koiwal was the lone shining light for the losing team, racking up nine points. The Spartans came into this match on the back of a loss against U Mumba Volley while the Defenders were searching for their first win after 3 back-to-back losses. Both teams needed a win to keep their chances of making the semi-finals alive. Buoyed by the vociferous home crowd support, Chennai Spartans were up and away in the first set, running away to a 4-1 lead in quick time after the Defenders had opened the scoring on the night. The foreign imports, Ruslans Sorokins and Rudy Verhoeff, were in prime form, landing spikes and executing timely blocks on their opponents. Rudy Verhoeff pulled off a Super Serve to take the Spartans into a commanding 9-3 lead at the technical timeout. Chennai raced away to a 11-5 lead, which prompted Ahmedabad to call for a Super Point. Naveen Raja Jacob, however, ensured there was no joy for the Defenders in the first set as he spiked the ball home to increase Spartans’ advantage. He, then, put the Defenders out of their misery as Chennai rounded the set up 15-6 to the delight of the home fans. The Defenders recovered well after the first set drubbing, and started out strong in the second set. The Spartans, however, managed to keep their deficit in check while Sorokins’ spike won a Super Point for the Spartans right after the timeout to ensure the race for the second set remained neck and neck. Novica Bjelica landed a couple of spikes after a good setting display by Defenders' skipper Ranjit Singh to keep the Defenders in the lead. As it was going down the wire, Naveen faulted on his service to hand the second set to the Ahmedabad Defenders. The third set of the match saw both the sides go all-out from the get-go as Akhin GS and Gurinder Singh landed spikes in tandem for their sides. Dilip Koiwal came off the bench and landed two cross-court spikes for the Defenders to help his team take the lead 8-6 at the stroke of the technical timeout. Naveen Raja continued his fine form after the timeout, scoring two kills from the left outside position to bring the Spartans level on the score. Ahmedabad called a Super Point at 9-9 and GR Vaishnav won them the advantage with a good spike from the center. 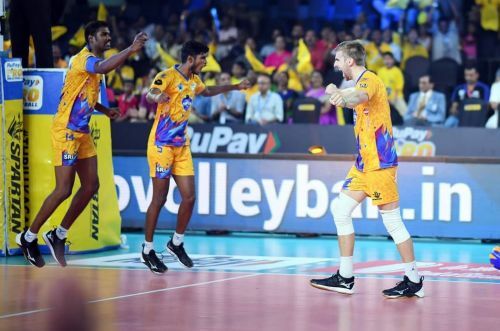 Chennai responded with a Super Point call of their own on the next play as Rudy Verhoeff's spike deflected off the blockers' arms to make it 11-11 in the set. Rudy Verhoeff got the set point for the Spartans but Dilip Koiwal struck again from the outside to keep it close. Their joy was cut short, however, as Sorokins won the set for the Spartans with a stunning smash across the court. The crucial fourth set began with Chennai Spartans continuing their momentum and Rudy Verhoeff leading the charge with three spike points. Vaishnav kept Ahmedabad in the hunt with regular points from the center. At the halfway mark in the fourth set, the Spartans led 8-5 with Shelton Moses joining in the party. Viktor Sysoev, however, ensured the Defenders don’t go down without a fight as he won a Super Point to keep the deficit at just 1 point (8-9). While Naveen and Akhin kept the Spartans ahead with a spike and a block, respectively, Verhoeff converted the Super Point for the Spartans restore their 4-point lead (13-9). The set, match, and place in the semis was wrapped up when Koiwal's spike fell out of bounds to indicate the Spartans winning the fourth set 15-11. Despite the Ahmedabad Defenders players knowing they’ve been knocked out, they gave a good account of themselves in the final set, with Koiwal leading the charge. Naveen and Rudy continued to star for the Spartans while the crowd refused to relent as Chennai took the lead at 8-7. Although the Defenders took the lead at 10-9, Spartans won both the Super Points with the help of their foreign stars - Verhoeff and Sorokins - to go 13-10 up on the scorecard. The hosts held on 15-12 and ensured a 4-1 win to confirm their place in the knockout stages. Rudy Verhoeff was at his best again for the Chennai Spartans, scoring 20 points for the third match in a row. He landed 18 spikes and had two points from his Super Serve as well. He overtook Calicut Heroes’ C. Ajith Lal as the most effective spiker in the league. The final league match of the RuPay Pro Volleyball League 2019 will witness the U Mumba Volley side take on Ahmedabad Defenders on Monday.